THE DEVIL FROM CHRISTMAS PAST — Faced with the fallout from his interaction with Cade (guest star Wole Parks), Stefan (Paul Wesley) is determined to have one thing go right – Christmas Eve with Caroline. 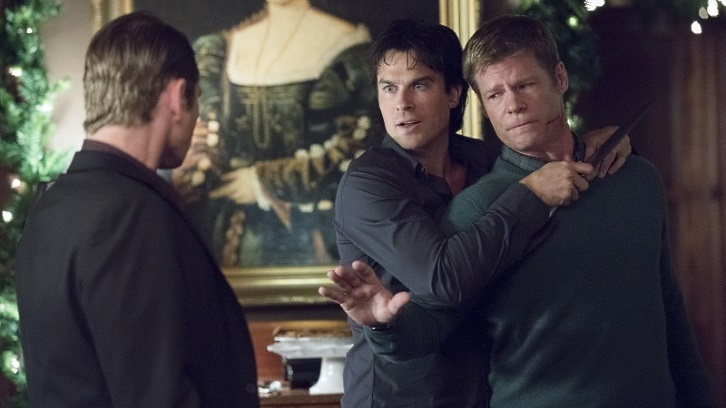 However, when Damon (Ian Somerhalder) and Sybil (guest star Nathalie Kelley) crash their Christmas Eve dinner, which had been joined by Alaric (Matt Davis), Matt (Zach Roerig) and Peter (guest star Joel Gretsch), things quickly take a dark and twisted turn. Meanwhile, in a series of flashbacks to Stefan’s past, Cade’s attempt to entice him with his mysterious agenda leaves Stefan faced with an unimaginable decision. Kat Graham and Michael Malarkey also star. Tanya Hamilton directed the episode written by Shukree Hassan Tilghman (#807). Original airdate 12/9/2016.